Trigger Pull: The trigger pull weight on the ASG Steyr M9-A1 is pretty typical of a double action trigger in about the middle of the spectrum. 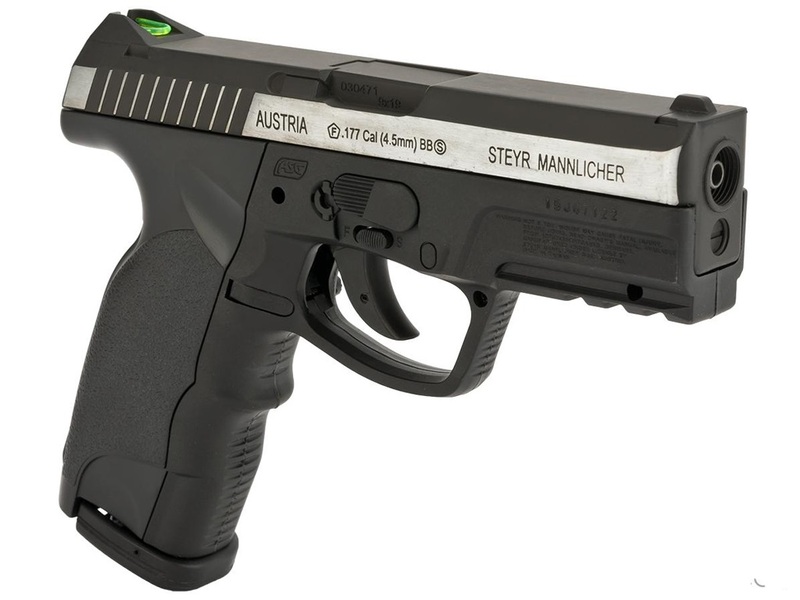 The action of the real Steyr M9-A1 is also DOA (double action only) as it uses a hammerless striker-fired trigger setup. Accuracy: I shot the ASG Steyr M9-A1 air pistol at a target from 20 feet away in a free standing position, and it performed respectfully, getting about a 2.5 inch grouping fairly close to the center of the target - just high and to the left. The rear sight is non-adjustable so if you find you shoot a bit off with this airgun then you will need to adjust your aim-point slightly. My Chrony testing with an eight shot averaged result was a very consistent 425 fps - right where the claimed manufacturer fps said it would be for this air pistol! Build Quality: ASG has not let me down so far with their guns and the ASG Steyr M9-A1 is no exception. It may not be the most complex or have a bunch of metal parts, but it does get the job done and with a lot of style. The plastic/polymer parts look well-made and the airgun has good overall weight for being mostly plastic. Fit and finish is also very good. Realism: The ASG Steyr M9-A1 BB shooter is a really close replica to the actual 9mm ASG Steyr M9-A1 semi auto 9mm pistol, the only real giveaway is the safety; a "real looking" one is moulded into the frame, but the actual usable safety (just below it) borrows from some other gun technologies and is a bit of a giveaway. 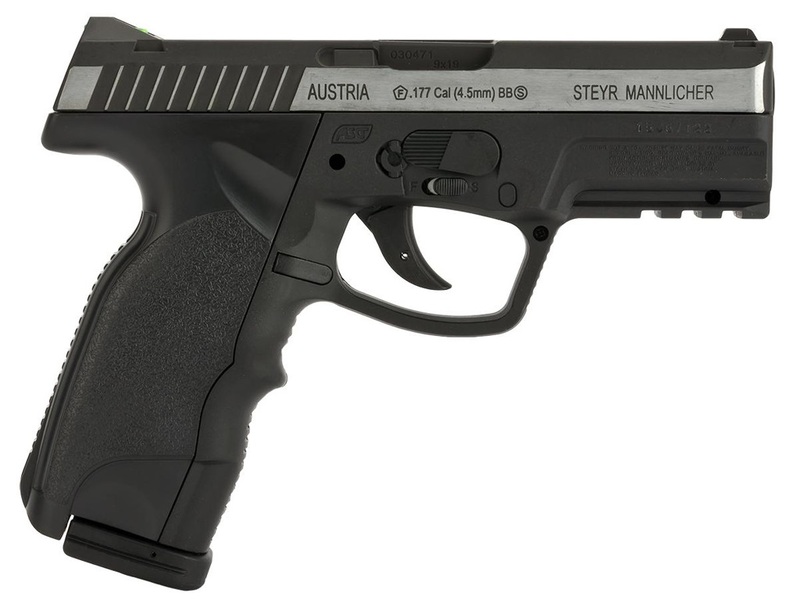 Other than that the ASG Steyr M9-A1 with its Steyr licensing and trademarks looks pretty much bang on to the original pistol. Really usable sights - Fiber optic in the back and white dot in the front! Comments: The ASG Steyr M9-A1 air gun is really made to be a BB shooter and so it does it really well by getting consistently high fps and lots of shots per CO2, the fact that ASG was able to make it look so much like the real ASG Steyr M9-A1 is an added bonus and even better is that this gun will not break the bank. Sure, it's nice to have blowback, a full sized drop out magazine and lots of metal parts but then the extra price tag that goes along with the extras adds up and can make an airgun unobtainable for some. 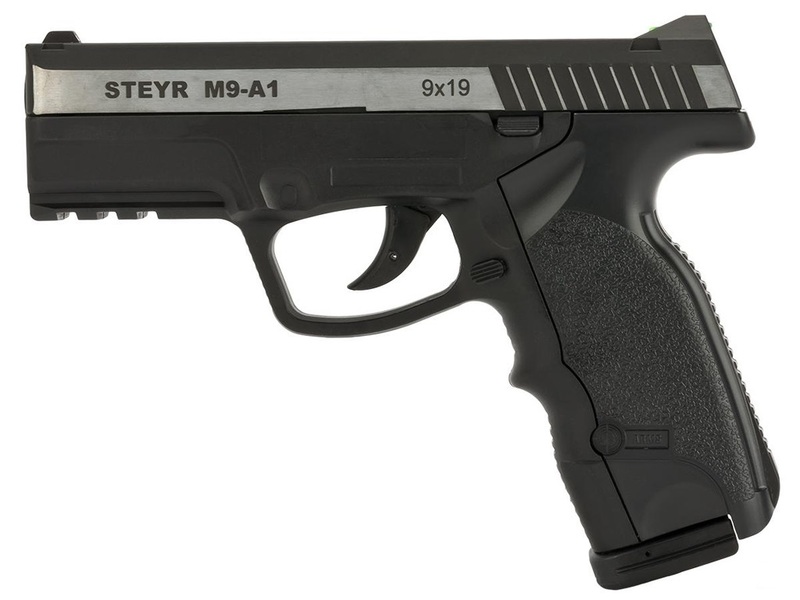 So if you're looking for an affordable really nice looking BB plinker you're going to get lots of good shots out of, the ASG Steyr M9-A1 may be just right for you! 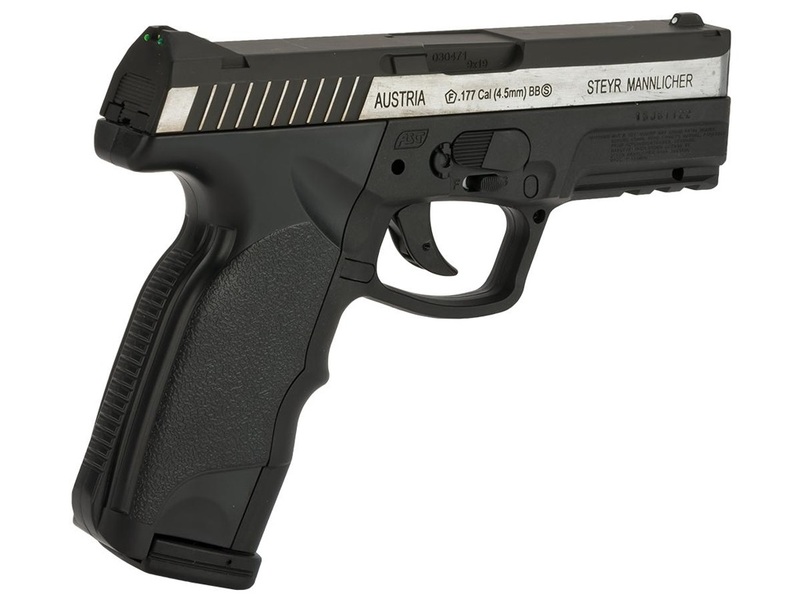 http://www.ReplicaAirguns.com -ASG Steyr M9-A1 Non-blowback CO2 BB Gun Review. This video is a walkthrough review of the ASG Steyr M9-A1 Non-blowback CO2 BB Pistol. I show off the gun close up from all angles and point out the components and the excellent quality and features this airgun offers . I also show you a target that I did an 8 shot accuracy test from 20 feet out in a free standing position along with the results of my Chronograph 8 shot test. - This gun gets lots of shot from a single CO2! The ASG Steyr M9-A1 is not as full featured as some of the other ASG air guns that I have reviewed, but then again it comes in at a much cheaper price point making it more affordable. Even with the lower price tag, there are lots of great points about this gun like fiber optic sights, metal drop out 19 round magazine, great ergonomics, consistently high FPS and awesome modern looks with good fit and Finish. When you add it all up it makes for a great replica BB shooter.